If we look back into history, one figure stands out. This figure relates to the number of Jews that were killed during the Second World War. More than 6 million Jews were systematically annihilated by the Nazi on orders of Hitler. This often makes people wonder why did Hitler hate the Jews. What was it about them that made him detest them to just an extent that he wanted to exterminate them from the face of the earth? Based on what Hitler wrote in Mein Kampf and the research conducted by historians, several theories have been put forth giving reasons for Hitler's hatred. Hitler wrote Mein Kampf as a semi-autobiographical book that highlighted his political ideologies. In this book he mentions an incident that took place when he was a young boy in Vienna, Austria, trying to enroll in the Vienna Academy of Fine Arts. However, his application was rejected, as the academy did not want another landscape artist. Nonetheless, Hitler convinced himself that the panel members who rejected his application were Jews and he mentions in his book that this was the time he really took a hatred to Jews. However, it is clear that Hitler's feelings for Jews actually compounded after the First World War. So, what he has written in his book may not be necessarily true. No doubt, he disliked the Jews, but using that single experience to exterminate millions of people just does not hold too much water. Another theory claims that Hitler's mother used to work in the house of a Jewish family, where the head of the family made her pregnant, resulting in the birth of Hitler himself. However, the family paid off the mother to buy her silence. At that point, Hitler's mother was already married. On finding out that he was the illegitimate son of a Jewish man and considering that his non-biological father was harsh disciplinarian could have spurred the hatred for Jews in Hitler. However, once again this is speculative and there is no evidence to support this theory. In Europe, there were always anti-Semitic feelings and after Germany was forced to sign the Treaty of Versailles to end the First World War, these feelings grew. Germans had to face a lot of economic hardship and they needed to blame someone. They were also humiliated with signing of the Treaty. So, they blamed the Jewish community that was rich and held positions of influence. The people claimed that the Jews made the country sign the Treaty under pressure, as they wanted to grow richer. It was this feeling that Hitler capitalized on and made his presence felt after the First World War came to an end. Most probably it was jealousy on the part of Hitler, as the Germans were struggling to make ends meet, while the Jews earning money as doctors, lawyers and other skilled professions. So, instead of blaming the German army for the debacle of the First World War, it was easier to blame the Jews. He thought that the Jewish people were taking away all good opportunities and chances that rightfully should have been given to the Germans, who were descendants of a superior race, the Aryans. It is also claimed that many Nazis, including Hitler, read a book entitled The Protocols of the Elder Zion. This book was notorious for being anti-Semitic. It is said that after reading the book, Hitler was highly influenced by it and it is quite possible that this lead to Hitler hating the Jews. There are also some historians that claim the hatred Hitler felt for Jews was fictitious. In other words, the hatred for Jewish people was fabricated for political mileage. As mentioned earlier, Europe always had anti-Semitic feelings. So, Hitler wanted to make use of these feelings in order to gain support from the public. 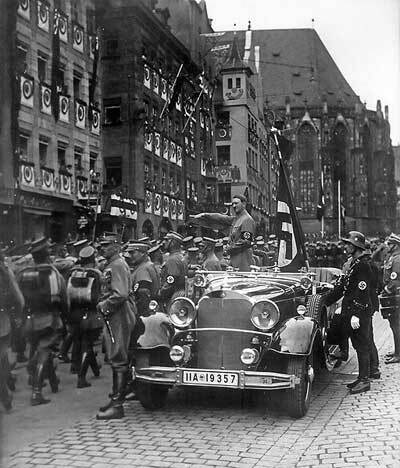 Therefore, he went about blaming the Jewish people for all the problems that ailed Germany and this helped him win support from the people. Perhaps, this is the most credible theory, as it shows what a shrewd political player. But somewhere along the years, the thin line between reality and this concoction got blurred and Hitler really began detesting the Jews. Possibly, this could be because of syphilis that he was suffering from. There are also claims that say his parents were suppose to be racists, but once again these cannot be substantiated. Hence, they join the several theories that try to explain why Hitler hated the Jews.